Is it possible to have a this type of condition? Based on the selected option of a drop down menu is it possible to have several options of other drop-down menu? I am setting up a form to collect responses from insured customers and therefore do a quotation. As there are many car manufacturer's and models, it would be very bad for the customer to select a car manufacturer and then have to choose his car model among hundreds instead of having only those thant belong to Volkswagen for example. Yes it is very much possible to create condition logic that will show/hide different or multiple dropdown list base on the selected option from the 1st dropdown list. 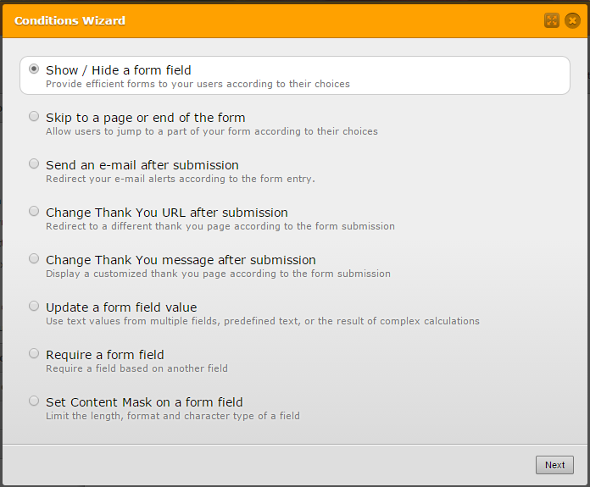 here is the demo jotform http://form.jotformpro.com/form/43514646570961? that shows the Dynamic Dropdown widget in action.